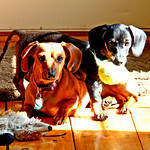 Doxie Archives on Hillbilly Hill Farm: And then there were four...again! And then there were four...again! About a week after Daisy left, we were sitting in the living room chatting when hubbies phone rang. He talked for a little while, told the people on the other end, he's have to talk to me then hung up. I asked what THAT was about, and he said it was someone he had talked to several months ago, who had a cow for sale. I laughed, and then asked how much...figuring it was sky high, knowing how the prices seemed to be going up...and up...every time I checked out craigslist. He told me, and I replied..."whats wrong with her", cause it was pretty low, less than half of what I'd been seeing them for. Less than we paid for Daisy when we got her several years ago when cows WERE lower in price. I guess she had a mild case of mastitis...she was located at an organic Amish dairy, so either they couldn't give her what most people do, and still be considered organic, or just wanted to get her out of their herd, if she was going to be having that trouble...I don't know just what was going on there, but we'd had good luck using Raw Apple Cider vinegar with cows that had mastitis...so hubby wasn't real worried about THAT issue. Since I was tired of not having milk (cause our cows dried themselves up late last year, hopefully cause they were pregnant) and hubby wanted her...we decided to get her since she WAS cheap! She was still in milk...although is suppose to have a calf in July, so should be drying up soon, so least I could start having some more milk for butter, ice cream and cheese! So...meet Poppy, our latest cow purchase. She was rather dirty when we got her as you can see...but has since gotten clean now she is out on good pasture enjoying what spring brings to this neck of the woods...nice fresh green grass!! So...we are back to four cows again. *sigh* No sign of more calves coming...so least we only have two in milk so far...but hopefully that will change. LOL Course...who knows, we may decide to sell one of our other ones...depending on how much trouble they get into. LOL Will see how it goes, as the year progresses. Just had to laugh, that yet again, we got a new cow...hubby just CAN'T cut down on how many we have...even if he's not really wanting to milk that many.